Webinars are a great way to fit a little extra learning into your day. 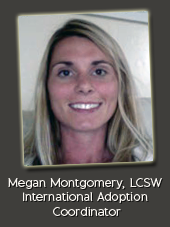 I love to sign up for webinars related to adoption to enhance my understanding of adoption related issues and learn more about the critical things families are struggling with. Plus I do not even have to leave the comfort of my office, no one sees me eating lunch when the class falls into my lunch-time, amnd oftentimes they are free. Recently, I participated in a webinar entitled “Parenting After Older Child Adoption” with Regina Kupecky. This webinar reinforced by understanding of the various stages one might see post adoption; in the way a child processes and adjusts to their new life. Regina said a few things that also just really hit home for me. I thought I would take the time to share these things – maybe one day it will come in handy for you. Ms. Kupecky says, “Anger is toxic to the family” – I thought this was a great and powerful statement. She used it when answering a question about how to manage the relationship between birth parents and our children. She stressed finding positive ways to cope rather than fostering anger because it does more harm. I think while we all know this, it can be hard to do. Maybe just keeping this quote in mind will help us all to focus on maintaining positivity and doing our best to stay away from anger. In fact someone once told me that it takes more energy to be angry than it does to be happy – so, let’s all save our energy to work on our relationships, rather than wasting it on just being angry. Another topic I have a lot of interest in is attachment. When talking about older child attachment and adjustment to becoming a part of the family, Regina mentioned a helpful ratio we should all keep in mind in older child adoption. i.e. a child adopted at 10 years of age spent 120 months without you, if you divide that by 4 you end up with about 30 months as an estimate for how long it might take for your child to begin to relax and adjust to their new family. I find this helpful because as I think it is important for us to be prepared for the transition for a child to be lengthy. While, each child will be unique, we should expect that it could take a significant amount of time for a child to get used to being with you. The way I often look at it is to expect that it could take as long as the child was without you for them to get comfortable being with you. I always view it as a milestone when the child has been with the family as long as they were without them. As I mentioned previously, Regina addressed some of the the stages a child may go through post-adoption. It does not always proceed along like a text book, however, and often the stages overlap. I have summarized and added in additional information to make a more complete overview of these common stages of post-adoption adjustment. THE HONEYMOON: This is the first stage that we often see. It might also be referred to as shock. We often call it the “honeymoon” because the child is getting along with us well – things seems perfect. The child may display little emotion, occasionally they may seem somber or express false happiness. The child is compliant, he/she does everything they are asked to do and never mentions the people they have left behind. Indicators of distress might include: sleeping problems (nightmares, tears), an upset stomach and perhaps an inability/disinterest in eating. TESTING: Often several weeks later, we begin to see stage two emerge. The child becomes less obedient, even making obvious attempts to threaten the relationship you are trying to build with him/her. They are trying to understand what is happening to them and why. They will likely push the boundaries, see what limits you try to set, with the goal of figuring out whether you will send them back “home”. Anger, crying, arguing and general disobedience are common at this time. This can take time to resolve. DESPAIR: Withdrawal is common at this time. They are giving up trying to control their situation and feel sad and hurt. While the child is pulling away it is important for the parent(s) to stay close. When your child has a breakdown, but won’t let you touch them to comfort them, you just stay there with them, close by so they know you are there. Your presence is more important that your being able to “fix” what is wrong. JOINING: Eventually the child will begin to realize that that they are ok. While, they may still miss their previous life and those they have left behind, they are able to look forward to the life they are leading now. There is a separation from those they have lost and a new attachment forming with those who are new in their life. My Brother My Sister Sibling Relations in Adoption and Foster Care curriculum. “Siblings Are Family Too”, published by the Three Rivers Adoption Council. A chapter on infertility issues, co-authored with Karen Anderson, in Clinical and Practice Issues in Adoption (Groza and Rosenberg editors). Abroad and Back: Parenting and International Adoption, a curriculum co-authored with Arleta James and Gregory C. Keck, PhD. While I have used a few specific quotes from the webinar, I am in no way representing Ms. Kupecky, this is just my summary and my own take away from the webinar. Keep your eyes and ears peeled for webinars that you might be interested in and then pencil them in to your calendar – it can really be worth your time. Learn about the country programs Adoption STAR offers and about the children in need of families and the requirements for adoption. Walk through the process of an international adoption and better understand the Hague requirements. Explore ways to decide if international or domestic adoption is best for you. The class will be held at the Adoption STAR main office: 131 John Muir Drive, Amherst, NY 14228. Please call (716) 639-3900 to RSVP or email info@adoptionstar.com.